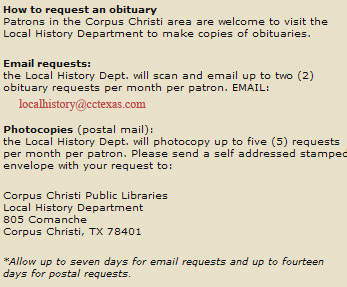 * This index shows the publication date for more than 200,000 of the obituaries that were printed in the Corpus Christi Caller (C), Corpus Christi Times (T), and the Corpus Christi Caller-Times (C-T). * Please note: this is an index only, date given is NOT the date of death. * The Obituary Index includes: 1893-1903 Select Index January 1950 through current date. * The Local History Department at the Central Branch has microfilm of the newspapers so that you may view and print the actual obituary or funeral notice.